10-20 old tyres are laid out next to each other in two rows. The runner must run a zigzag through the course always placing his foot in the middle. This task can also be integrated with an obstacle course. All of the tyres are laid out behind each other. 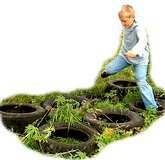 The players may only run over one tyre or in the middle but definitely not touching the ground to the right and left of the tyre. The distance of the tyres can be varied. Speed is important. The fastest team is named as the winner.